the last weekend was jam-packed, considering that i was virtually useless for about 8 hours on saturday. friday evening was 2k9's acquaintance party. as i had correctly predicted, the batch would request for a postponement to the usual date: there were delays in selecting batch reps and organizing the whole thing, so they moved it one friday forward. and a good thing too: at least i didn't have to rebook my earlier flight to cebu city -- or worse, not show up at the airport altogether! so after i got out of work last friday, i was already thinking of a costume. the theme was star. initially, i had wanted to come as the STAR tollway: my concept was to have tire tracks over a white t-shirt. i had difficulty finding a car to do that. so i sped off for market! market! to see if i could buy star studs to paste on a shirt. there weren't any, and i somehow found myself inside a toy store. i bought a set of 4 toy cars for P40.00, then bought a fabric pen from national bookstore for P56.00, went home, took out an old polo shirt, and began scribbling a road and some road signs. then, i took out my sew no more fabric glue and pasted the cars over the road, and voila! a costume! before i left for the party, i had dinner with cisco and former colleagues from B&M at gilligan's in park square. they have the strangest policies in the world, i swear. they said i can't drink beer (not that i wanted to) because i was wearing shorts and slippers. i couldn't see the logic behind it. and the food was really bad: the peanut butter in the kare-kare was in clumps, and the sinigang was made with too much instant powder! i prefer gerry's over gilligan's any given sunday! after dinner, i went home and left for pedro's warehouse in pasig. once i got there, i found the place huge, and nearly empty. it was already past 10pm. i deposited my contributions: jaggermeister and bailey's, and started shooting. it would be my first time to use an UWA for an event. thank goodness for the speedlight! raspatuberos performed, followed by a dance number which JC choreographed, and then some ho-hum games (i had to take over at one point), and finally tey's revenge. i wouldn't say that the party wasn't fun, but i can actually have fun without a lot of effort. i just felt that it was a bit lackluster, despite the theme. there were members, yes, but what disappointed me was that there were very few participants from the trainees themselves. i already know all the members, so i want to be acquainted with the new batch! i think maybe they need a lot more motivation to get to know the club and its members and the traditions of the majority. anyway, i was about three steps from getting stone drunk. many times, i had to literally run away from drinks. 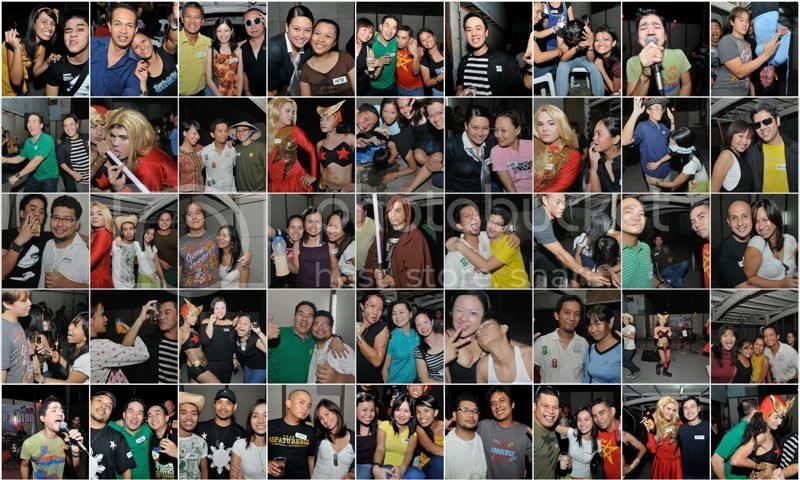 i might have had around 4 bottles of red horse: which are enough to wipe me out, usually. but others got drunk ahead of me, and i had to hold on to my sobriety to survive. the following day, i woke up at lunch time with a bad headache. i uploaded photos of the party to facebook, while learning that cory had passed on. i popped ibuprofen and then went back to sleep. i got up again at 6pm. 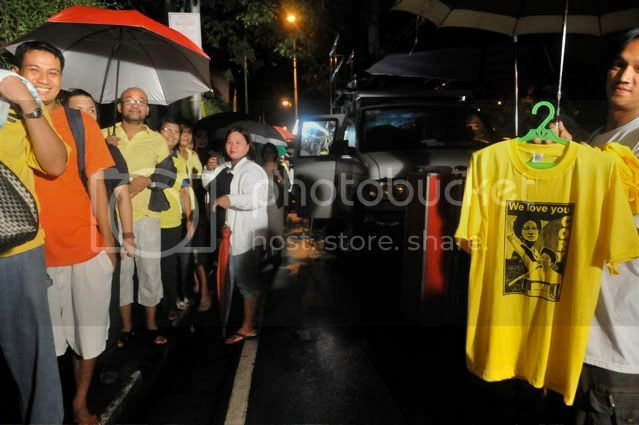 xenon was inviting me to accompany him to la salle to pay our last respects to the late former president. i wasn't too keen on falling in line in the rain, but more out of curiosity than an actual desire to honor cory, i agreed to meet up with him. i am not a big fan of cory. the EDSA revolution took place when i was 9 years old, and cory was president till my last year in high school. what i remember of those years were protest after protest and a string of coups. i do not have a high regard of cory's presidency. i think she was a weak leader, did not have a clear plan for the economy, was not able to battle corruption, and was ill-experienced and ill-equipped to restore democracy. and i say that also with the benefit of hindsight as well as history. lately, before the onset of her sickness, i also felt that she made statements which cast doubt on her wisdom, and until lately, aligned herself with personalities that do not stand for the same things she supposedly does. people call her an icon and a symbol. it would not be honest of me to agree. but i will not debate with anyone who believes otherwise. they are entitled to their opinions, though i may not always see why. 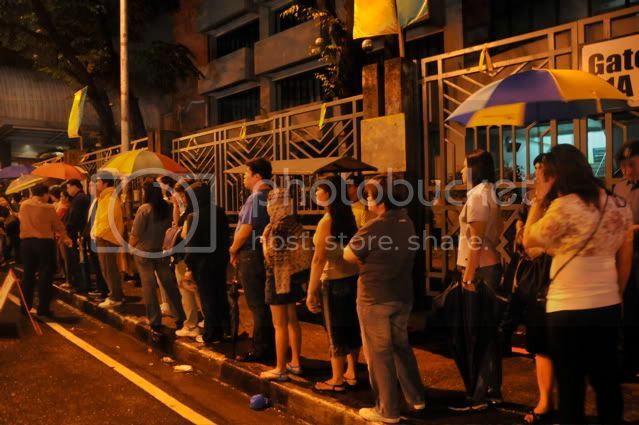 outside la salle, the line had reached the foot of the flyover. by the time we stood on the queue, the end was nearing EDSA. we managed to get inside after about 40 minutes. once up at the la salle gym, i saw how different it looked in real life compared to the gloss of television. 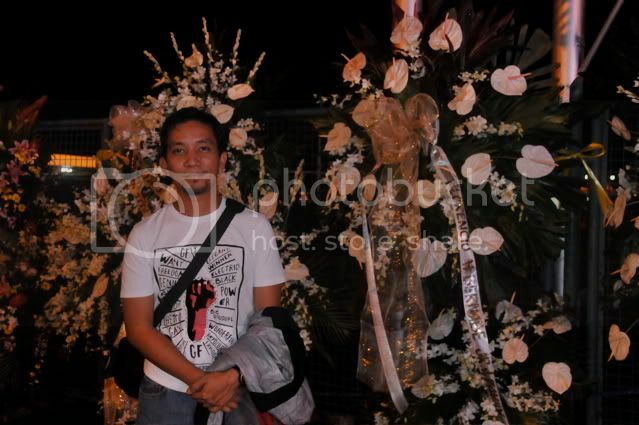 there were flowers all around and kris's son, joshua, was acting strange and even inappropriate beside cory's casket. event security was hired for the wake, who instructed us to hurry along. it isn't my habit to look at open coffins, but we weren't really allowed to linger. i had less than 3 seconds to glance at cory: her hair was jet-black, and she had a bright color on her lips. she was wearing yellow, of course, and may have looked younger than when i last saw her in one of her public appearances. after that, i was showed the door. exit left. anyway, i don't really like to ride the wave of the majority and talk about the hottest topics that's consuming the collective unconscious. i leave that to the opinion makers and those who have no original ideas. so before i invite some unnecessary flame, i'll stop at that. offT: are you joining the dean's cup fun run/triathlon?! the phil star shirt was an option: but it was too easy. haha. don't get too excited.